When you study the letter r these things that start with r cards might be a great addition to your curriculum. You might want to use them in centers or as a quick practice of the letter r sound using the everyday words on the cards. 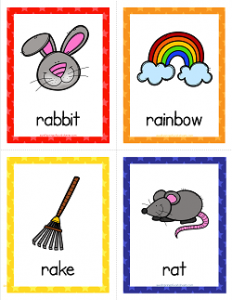 The words are: rabbit, rainbow, rake, rat, ring, robot, rocket, and rose. The third page of this set has some more ways you can use these cards.